Just a few years back, I used to drink alcoholic beverages without knowing much of anything. Going to the bar at the time was pretty much about hanging out and getting drunk. I had no idea that there’s a long and an interesting history behind alcoholic drinks, not to mention the categories along with the appropriate occasions or time to have them. Fortunately, it came the time when I was told that “serious” drinking is not at all about getting drunk or how much you can drink, and to tell you the truth, this “little piece” of knowledge not only has saved me from further embarrassment, but also given me much better enjoyment in drinking. Since that moment, my curiosity just gets bigger and bigger. One of the things that I found out later was the origin of the word whisk(e)y; it was derived from the Gaelic words Uisge Beatha, meaning ‘Water of Life’ in English. For a guy who associated drinking with getting drunk, I must say that this history was just too ‘philosophical’ for me. The first question that came to my mind was how could it be? Followed by who made it first, and when? Well, no one knows exactly when the whisk(e)y distilleries were first established, but there is evidence showing that Celtic Christian monks in monasteries already started distilling whisky in the early 15th century. The whisk(e)y then was intended as a remedy for stomach ache, paralysis, smallpox, and even to preserve the health and prolong the life. So, based on such finding, the puzzle over my head was solved. The dismissal of the monasteries between 16th and 17th century caused the monks to apply their knowledge and skills in society. From then on, the know-how in making whisk(e)y had spread to a larger public; drinking whisk(e)y quickly became the daily part of social life. Whisk(e)y became a gesture to greet and welcome others besides a drink to warm themselves during winter season. Whisk(e)y also had transformed into a bond that strengthens not only social relationships but also fraternity among warriors in war. So having whisk(e)y is not about getting drunk; it’s a culture, having its own history, values, and symbols, and we owe every enjoyment in having a whisk(e)y to the Celtic monks. At the end of 19th century, there was a pest problem in France. The beetle devastated French vineyards, and within just a few years, wine and brandy had disappeared everywhere. 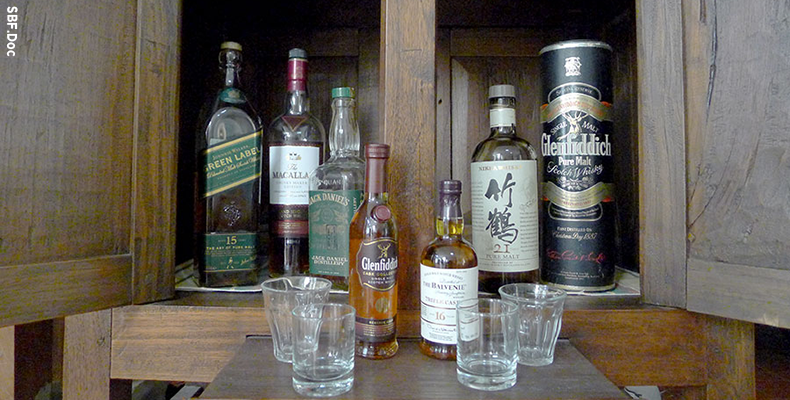 The Scots were quick to fill in the subsequent unserved demand of high alcohol beverage (spirit) with Scotch whisky. By the time the French vineyard recovered, Scotch whisky already positioned itself as the preferred choice of spirit. The emergence of this early industrialisation reached even the most remote valleys in the Scottish Highlands. The rural farms with distillation became economically independent companies. New train routes were made available, reaching the farthest corners of Scotland, so that the malt whisky became easily distributed to the cities. At this time, blended whisky was the most popular demand; the single malt whisky preferred by the Scots was utilized as a spice for blended whisky elsewhere. Such a blend gave the world many popular brands like Dewar’s, Haig, Johnnie Walker, Chivas Regal, and Ballantine’s. 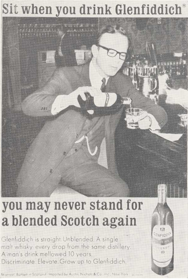 The international demand for blended whisky made Scots companies grew, and the name Scotch became a byword for whisky. At the time, the whole whisky industry heavily depended on the Commonwealth with British crown colonies, and United States. So when World War I, and the prohibition for alcoholic beverages in the US (1919-1933) took place, the whisky companies faced serious problems. The recovery began at the end of prohibition, and when Britain was allowed to pay its war debts to the US in the form of whisky. After the war, concentration happened in Scotch whisky distilleries. The global expansion led by US and Britain created stiff competition, so distilleries either merged with or taken over by the big players. Scottish Distiller’s Company Ltd. became the winner and took over many companies and distilleries. Unnoticed by the big players, the family-owned Glenfiddich distilleries marketed their single malt Scotch whisky globally. The marketing success made their product recognized as a specific type of whisky as we know now. When the big players woke up, Glenfiddich already had its piece of the pie in the market. Today, Glenfiddich is single malt whisky market leader, the number one top-selling single malt whisky not only in the UK, but also globally. 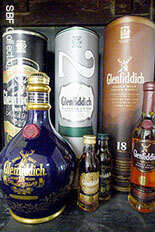 Glenfiddich has been established for more than 128 years (est. 1886/1887) by William Grant in Dufftown, Scotland, in the Glen of the River Fiddich. In Gaelic, the name Glenfiddich means ‘Valley of the Deer’, hence the presence of a stag on Glenfiddich bottles. Glenfiddich is one of the few single malt whisky distilleries to remain entirely family owned and is now managed by the fifth generation of William Grant. According to Scotch Whisky Association, there are 5 whisky regions in Scotland based on its geography. Glenfiddich distillery is located in Speyside in the northeast region of Scotland, a region considered to be the center of single malt Scotch whisky production. Scotch whisky brands from Speyside are mostly popular particularly outside Britain, this include brands such as The Glenlivet, Glenfarclas and The Macallan. Around 1920s, despite of the prohibition to manufacture, transport, or sell alcoholic beverages in the USA, Glenfiddich dared to increase their whisky production. This move placed them in a strong position, as they were able to fullfill the increasing demand of good quality and well-aged whisky following the retraction of the prohibition. 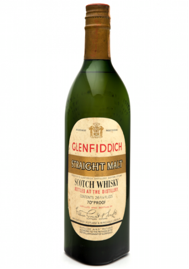 As there were many whisky distilleries that went bankrupt or were sold off in the 60s and 70s, Glenfiddich on the other hand did a few major breakthroughs. First, Glenfiddich teamed up with Hans Schleger, a designer and 20th century pioneer for concept of brand/corporate identity, to release a triangle shaped bottle that was considered radical at the time. The new shape then becomes the iconic identifier of Glenfiddich. Secondly, marketing campaign outside Scotland and Britain has positioned single malt whiskies as a specific category of whisky as we know now. Lastly, Glenfiddich was the first ever distillery that provided a visitor’s center for the convenience of their guests. Glenfiddich was one of the first few alcoholic beverage brands or distilleries to realize the importance of duty-free markets for spirits, and had recently started to cover its bottles with tin tubes which can be presented as gifts or souvenirs. This marketing strategy succeeds in placing Glenfiddich as the most popular single malt whisky and has won more awards than any other single malt Scotch whisky at the International Spirits Challenge and International Wine and Spirit Competition. Corporate world is often considered to have nothing to do with culture, or vice versa, but there are actually sectors that were born out of cultural manifestations as we can see with whisky in Scotland. I am sure that there are other industrial sectors that departed from equal spirit. The food or culinary sector for example, most emerged from certain localities; Chinese, Indian, Japanese, and Thai food or restaurants are just a few things that prove my point. The same thing with the musical instrument industry; jembe, tabla, bongo, flamenco guitar are among other instruments that originated from local musical traditions. Drinking whisky has long been a tradition in the culture of the Scots. The whisky itself becomes one of the flagships of their culture in the global world.